I'm from Pennsylvania, so the Eastern PA SCBWI (Society of Children's Book Writers and Illustrators) Poconos Retreat will always have my heart, but the NJ SCBWI annual conference in Princeton, NJ exercises my brain! There are more workshops (5 on Saturday and 3 on Sunday), more editors, more agents, more opportunities to learn -- and to absorb the glow from such luminaries as Lauren Oliver, Wendy Mass, Tara Lazar, Corey Rosen Schwartz, and Ame Dyckman, winner of this year's Crystal Kite Award (for the Atlantic region) for Boy + Bot. Is this book adorable? Affirmative! The NJ conference is a little exhausting. Okay, it's extremely exhausting, coupled with the fact that I didn't sleep more than 4 hours each night. My first workshop on Saturday morning was my favorite of the weekend. Kit Grindstaff, debut MG author of THE FLAME IN THE MIST, and Jennifer Hubbard, YA author of THE SECRET YEAR and TRY NOT TO BREATHE, took us into The Dark Underbelly and taught us how to add flaws, secrets, and lies to deepen our characters and their stories. What ghosts from the past haunt your character? What skeletons are in their closet? What don't they know about themselves? This workshop helped me realize what was missing from my novel. And I highly recommend Kit Grindstaff's novel (which I finished reading after the conference). With the help of two magical golden rats, a friend named Digby, and an ancient book, Jemma must fight the evil Agromond family and the Mist that has overtaken Anglavia. 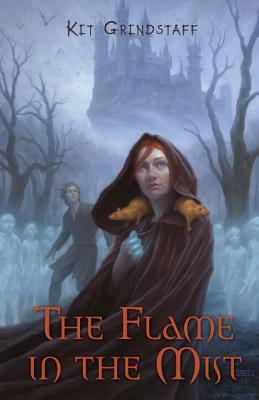 If you like your MG fantasy action-packed and dark, with a strong female protagonist, if you like getting lost in a long (449 pages) and fascinating tale, with excellent worldbuilding, The Flame in the Mist (Delacorte, April, 2013, for ages 9 and up) should be on your TBR list. Sorry -- I can't give away my hardcover. It's personalized! One of my other favorite workshops was run by Wendy Mass. You've seen her mentioned on this blog more than once. Using examples from her newest book, PI IN THE SKY, Wendy taught us the secret to her success. She doesn't outline; she blueprints. This is her term for a system in which you start with a list of 20 important events that must happen in your novel (each described in one or two words). Then you rewrite them in the order you want them. Take the first idea and that becomes Chapter One. Your next step is to list 10 important events that must happen in Chapter One (or you can use 5 or 6 events if it feels too long). Step 3 is to change each idea into a who, what, when, where, or why question. And then answer them. Do this for each chapter and you have a complete Blueprint. When you're ready to turn it into a novel, write a page for each of the chapter ideas. It's as simple as that. I can't wait to try this method myself. 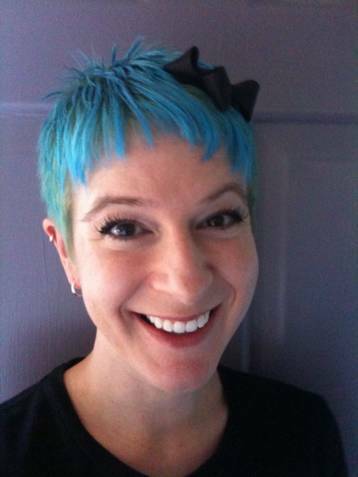 Next week: POV and Scene Structure, plus a funny and touching moment with Tara Lazar, author of THE MONSTORE! Are you a member of SCBWI or some other writing organization? Have you ever attended the NJ conference? Congratulations, Akoss! Look for an email from me, asking for your mailing address. Albert Whitman will be mailing your copy directly to you. Last weekend, I attended the NJ SCBWI conference and I'll be posting my impressions of that next week, but I'm still catching up (and revising like mad), so for now, go visit last week's book blogger panel at Random Acts of Reading. We talked about what new books we're anticipating the most! ... about that image to the top right of the page. WRiTE CLUB?? What the heck is that?? It's a chance, people. An amazing chance to submit your own unpublished writing in a 500-word sample and have it anonymously go head-to-head with another sample in weekly bouts. The two samples each week will be judged by bloggers and writers like you. It's the third year for this annual contest. You may not be chosen, but you definitely won't be chosen unless you enter! Visit DL Hammons' blog, Cruising Altitude 2.0 for details. But hurry -- you only have until June 30, 2013 to submit your writing! 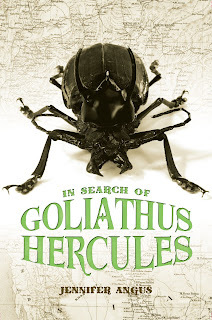 In Search of Goliathus Hercules Blog Tour -- and a Giveaway! Today, I'm participating in the blog tour for In Search of Goliathus Hercules. Source: hardcover review copy from the publisher in exchange for an honest review. Synopsis (from Indiebound): In 1890, Henri Bell, a near-orphan, is sent to live with his ancient great-aunt and her extensive button collection. One rainy afternoon, Henri strikes up a conversation with a friendly fly on the windowsill and discovers he possesses the astounding ability to speak with insects. Thus commences an epic journey for Henri as he manages a flea circus, commands an army of beetles, and ultimately sets out to British Malaya to find the mythical giant insect known as Goliathus hercules. Along the way he makes friends both insect and human, and undergoes a strange transformation of his own. Why I liked it: Packed with adventure and imagination, this is a fascinating story that will appeal to fans of fantasy, historical fiction, and adventure novels. Henri (pronounced On-ree) is a sympathetic character, especially as he begins to take on unusual characteristics. Though it's a thick book (350 pages) it's fast-paced and exciting enough to keep you turning pages. And now, an exclusive interview with Jennifer Angus! 1) Hi, Jennifer and welcome to My Brain on Books! You are, first and foremost, an artist and a professor of Design Studies at The University of Wisconsin/Madison. You've had numerous successful exhibits of your Victorian-style wall pieces. Is it true that you use real insects in your patterns? And how did you become interested in insects? Yes, all the insects I use are real, that is with the exception of Goliathus Hercules himself who I created in the great tradition of hoaxes with the parts of several insects and gold glitter (everything is better with glitter!). That’s the most common question I get asked and people also want to know if their colour is natural which it most certainly is. I’m crazy but not crazy enough to start painting thousands of insects. Like most professors part of my job is to do research. I was researching tribal minority dress in Northern Thailand when I stumbled upon a garment from the Karen tribe that had a fringe of green metallic beetle wings. I was stunned. Other than butterflies I had never thought of insects as being beautiful. Through further research I’ve discovered other groups, primarily in Asia that use insects as embellishment and actually in the Victorian era round sequin-like shapes were cut from beetle elytra (the hard protective outside wing) and applied to fancy fabrics. 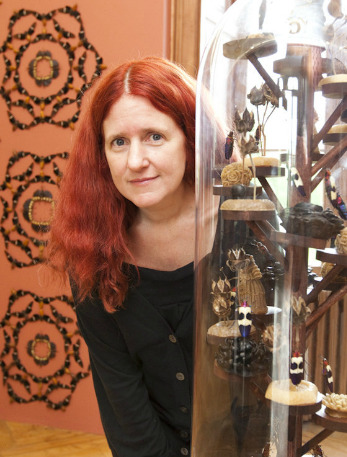 I always say that I my interest in insects really grew out of my research and love of textiles. 2) What made you decide to take the next step and write a book about the insect world? 1. Are the insects real? 2. Is this their natural colour? 3. Did I collect them myself? I enjoyed creating exhibitions with a narrative and I furthered my story with a trilogy of exhibitions all called “A Terrible Beauty.” I also created an online, storybook version of the narrative which you can see here http://digitalthreads.ca/en/nature/artwork.cfm Eventually a small children’s publishing company invited me to write the story that underlies the exhibitions. 3) The illustrations in the book are fascinating. Not only have you designed borders and chapter headings with patterns of insects, but you also used what look like old photos and postcards. It makes the book seem more realistic since you have photos of Henri and his friends and Henri's nemesis, Mrs. Black. Did you scour antique stores for photos from the era? Or are these recreations? Most of the photos were purchased on E-bay although there are also photographs of objects that I owned and had previously used in my exhibitions such as the five year diary and the cricket cage buttons. I created many illustrations of Mrs. Black in her various disguises by simply Photoshopping her face into the antique photographs. That was a lot of fun and at some point I’ll put up the ones that didn’t make it into the book on my web site. 4) While reading this, I thought of Franz Kafka's Metamorphosis, but also of Roald Dahl and even The Wizard of Oz (Mrs. Black reminded me a bit of Miss Gulch. And of course you have a motley crew of individuals who go on a quest). Were there any particular middle-grade novels that influenced you? Did you read a lot of novels before writing this, or did you just start writing? I agree that Mrs. Black owes a lot to Miss Gulch, particularly in her appearance. I found her absolutely frightening as a child. 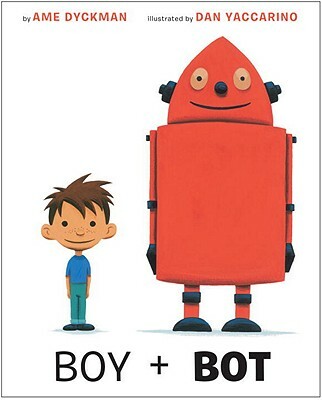 I’m not sure that any particular book from my childhood influenced my writing but reading aloud to my son who is now almost 16 probably had a greater impact. Together we really enjoyed reading Kenneth Oppel’s Silverwing Saga (4 books) that is about a family of bats. He also wrote Airborn and although Oppel never reveals its era exactly, it seems Victorian in a steam punk kind of way. When I was a child I read Dahl’s Charlie and the Chocolate Factory (and loved it) but that’s the only one of his books I ever read at that time. My mother was a great storyteller and my brother and I really preferred that she tell us a story than read anything. She told stories about growing up on Woodland Farm (the real Woodland Farm) and how she would go down a magic well to other lands where in one everything was blue and in another everything was yellow. We loved it and of course we believed it all because they were her adventures. I think that my mother instilled a real love of stories and adventure. 5) Is there a sequel in the works? Or are you writing something new? I have ideas for further adventures of Henri and his friends. We’ll see if people want to read them. Please note that this giveaway is open to addresses in the U.S. and Canada ONLY. 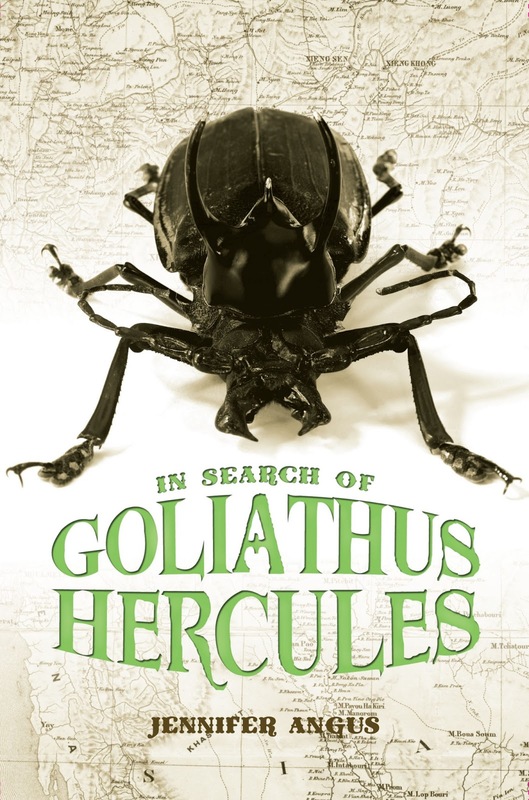 Albert Whitman will give away one SIGNED hardcover copy of In Search of Goliathus Hercules to one lucky winner. To enter, all you need to do is follow this blog (click on Join This Site in the sidebar) AND leave a comment on this post! This giveaway will end on Sunday, June 16, 2013, and the winner will be announced on Monday, June 17. Good luck!